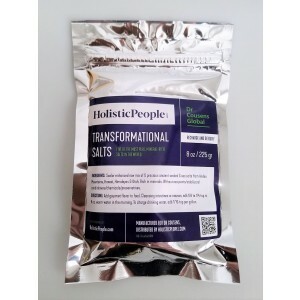 Transformational Salts are mineral-rich, pure, raw, unbleached, unheated, unrefined ancient salts of the Earth, containing no harmful synthetic excipients. 100% pure and Scalar enhanced raw mix of 5 precious ancient seabed & sea salts of the earth from the Peruvian Andes Mountains, Hawaii, Himalayas & Utah rich in minerals - without excipients, stabilizers, conditioners, chemicals or preservatives. Tachyonized Water, 4 fl. oz. 100% pure and Scalar enhanced raw mix of 5 precious ancient mineral rich seabed of the earth. Without excipients, stabilizers, conditioners, chemicals or preservatives. Scalar activated salt contains a scalar charged mixture of ancient seabed salts from high vortex areas of Peru, Hawaii, Tibet, and Utah. Scalar salt comes from underground, containing a broad spectrum of trace minerals. Dr Cousens does not recommend using any type of sea salt anymore for many reasons, mainly because seawater pollution and radiation. Salt is a crystal that reconnects you to the different high vortex earth frequencies. These scalar salts reestablish a healthy resonance between our bodies and the earth. They contain volcanic ash and red clay from the Big Island. Dr Cousens recommends taking a pinch of this salt 4 times daily. High quality sea salts with ionic bonds helps build Ojas (essential energy in the body), are useful for hydration, mineralization, and a good sodium-potassium balance. Often people have extracellular fluids that are quite mineral depleted. The least expensive way to improve this is with ionic salts such as Transformational salts. These salts are non-heated salts. They have ionic bonding. Transformational salts contain about eighty-two minerals. In this ionic form they taste almost sweet and savory and bring the saliva into your mouth. If they have turned covalent, they usually have a bitter taste and drying sense. If salt creates a savory and watery feeling in the mouth, then it is still ionic. If it dries the mouth, this suggests that it has converted to the less assimilable covalent form. In place of regular salt. Additional uses : 1/8 to 1/4 of a teaspoon in 8 fl. oz. of warm water in the morning for cleaning the intestines and for nausea; 1/16 of a teaspoon in a gallon to charge drinking water; smidge on tongue tip for nausea/ hunger/blood sugar; 2-3 tablespoons help raise a 2-put sea-salt detox bath frequency. (Up to 70-90% lymphatic toxins can exit skin if allowed such as with sea-salt detox baths.